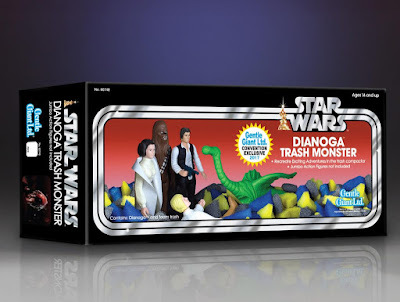 Gentle Giant will be traveling to Orlando this weekend for Star Wars Celebration 2017, where they will be releasing two really cool exclusives, including this awesome Star Wars Jumbo Vintage Dianoga Trash Monster figure! It’s been awhile since Gentle Giant has released a Jumbo Vintage Kenner Star Wars action figure, and this one is a HUGE surprise. When the original Death Star Space Station Playset was released in 1978 the designers had to take some creative license on the included trash compactor monster. 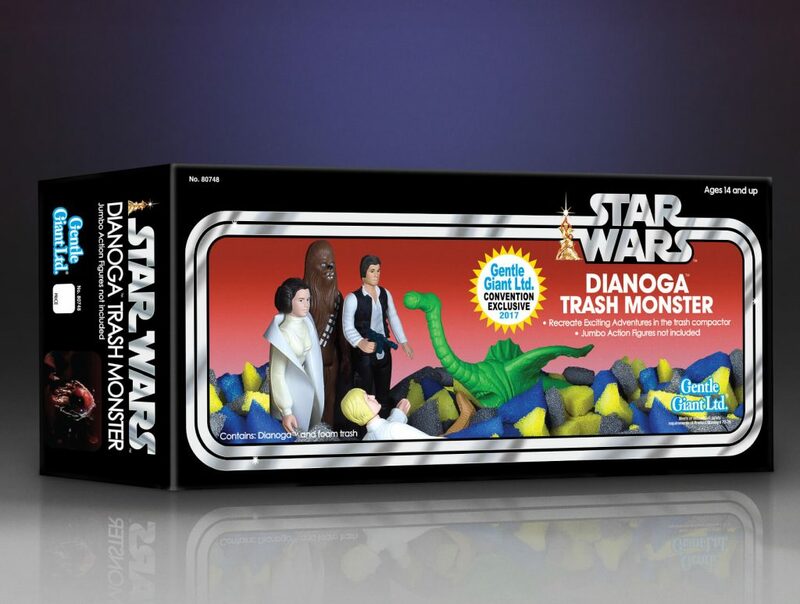 Although we all knew about the eye stalk and the tentacles, this release gave the Star Wars universe its first full look at the Dianoga Trash Monster. The fact that it had wings, a mouth full of teeth and even a fin was a crazy revelation to kids everywhere. Now the thing lurking in the muck of the Death Star had a “face”. So grab your jumbo Han, Luke, Leia and Chewbacca action figures, because now you can re-enact that pulse-pounding trash compactor scene from Star Wars Episode IV: A New Hope with this convention exclusive Jumbo Dianoga Trash Monster! Celebrate the 40th anniversary of Star Wars with part of one of the greatest playsets in the history of toys! 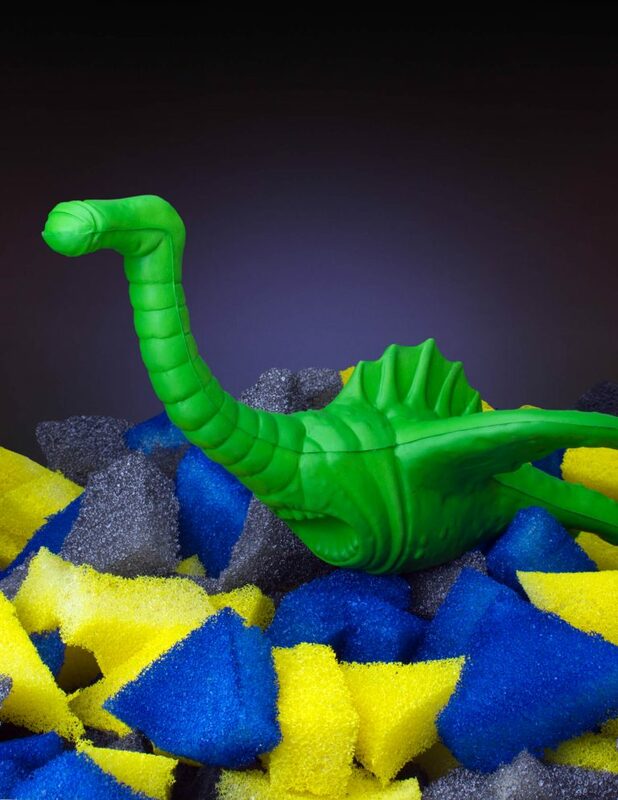 Scanned from the original vintage figure and reproduced to a whopping 12” scale, Gentle Giant’s Jumbo Dianoga Trash Monster is 6”h x 7.25”w x 14”d, comes packed with accurate 3 color foam “trash”, and comes packaged in a spectacular vintage inspired full color box! 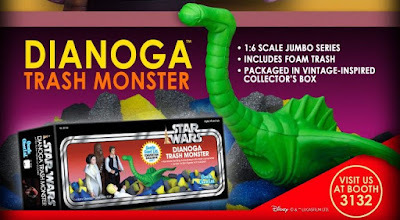 Fans can purchase it at the Gentle Giant Star Wars Celebration booth #3132.